Disclosure: This How To Make a DIY Coffee Bar at Home post has been sponsored by SharkNinja makers of the Ninja Coffee Bar System. They have furnished me with the Ninja Coffee Bar System. All opinions are my own. Have you been dreaming of making a DIY Coffee Bar at home? I refinished an old kitchen cabinet and created my own coffee bar station in my kitchen. 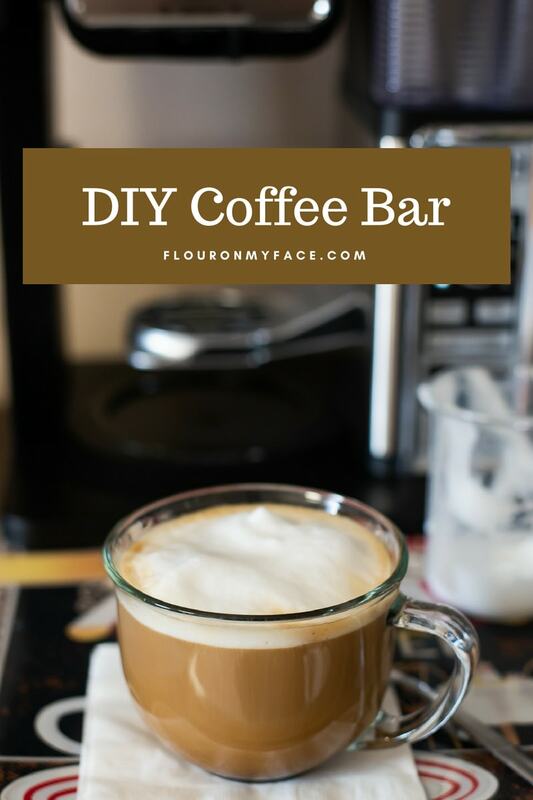 DIY Coffee bars are all the rage and they are so easy to set up. Just a cozy little spot near an outlet to set up an awesome coffee maker like the (affiliate link) Ninja Coffee Bar System. 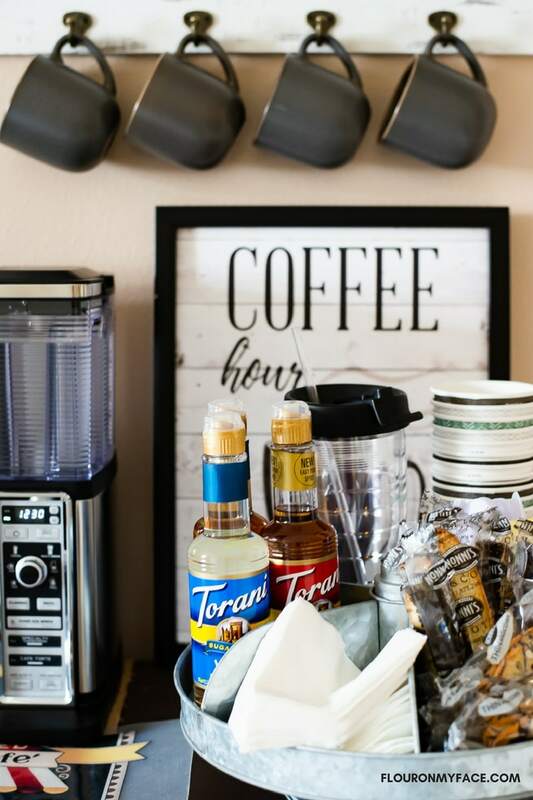 Mom’s everywhere deserve something special for Mother’s Day and if your mom is a coffee lover than she will love her own DIY Coffee Bar station in her kitchen. Why buy Mom or someone special the Ninja Coffee Bar System? Because the Ninja Coffee Bar System is the perfect coffee maker that will fit any coffee lovers needs. 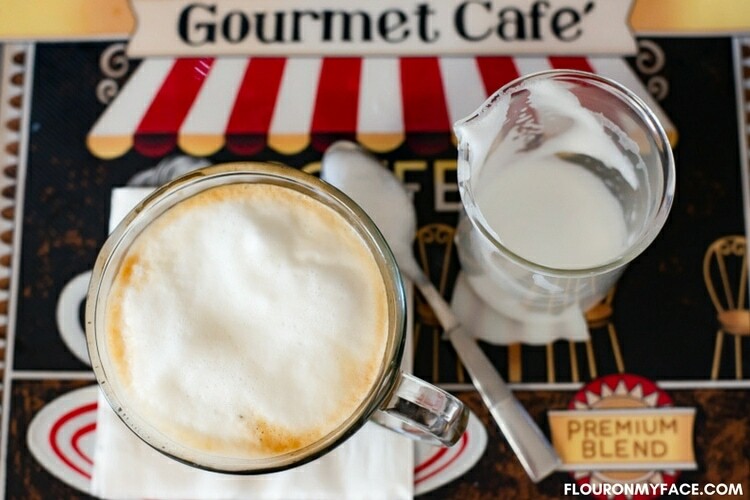 You can brew a delicious cup of coffee or brew coffee house style drinks at home. The Ninja’s unique coffee brewing technology brews the best tasting smoothest cup of coffee at home with just the push of a finger. I bought my mother in law the Ninja Coffee Bar System for Christmas because for months she had been telling me how much she wanted one. She and I are both big coffee lovers. While she likes to brew a half or full carafe of coffee I love the convenience of brewing my favorite coffee one cup at a time. The Ninja Coffee Bar System lets you do both. 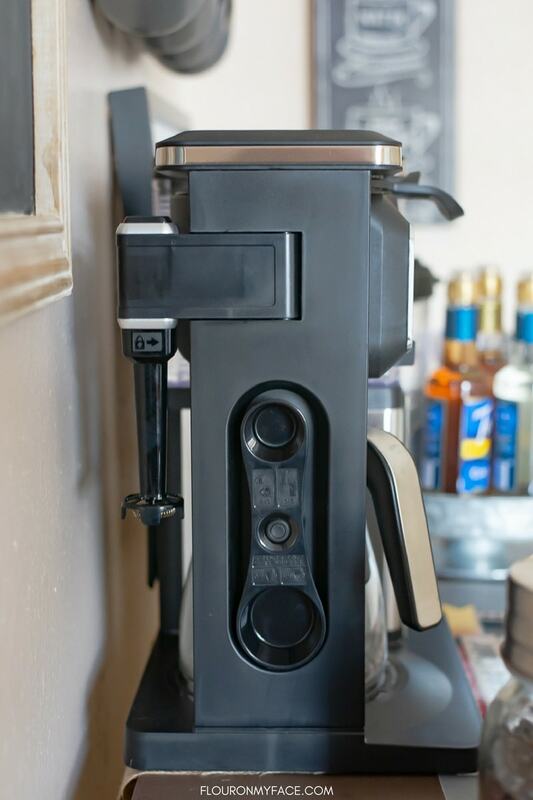 An added bonus is that you don’t have to deal with disposing of all those plastic single-serving coffee pods because with the Ninja Coffee Bar System you can brew a single cup of coffee or a carafe full of coffee without them. 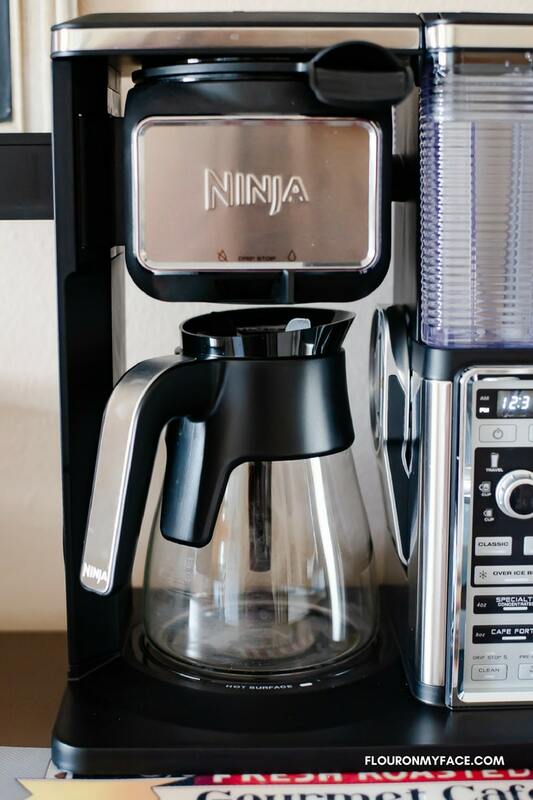 With the Ninja Coffee Bar System, you use your favorite ground coffee or you can grind fresh coffee beans and use the built-in reusable coffee filter. If you don’t want to mess with dumping and rinsing the built-in coffee filter you can use paper coffee filters. The built-in Ninja Smart Scoop coffee measuring scoop snaps and attaches to the side of the Ninja Coffee Bar System making it easy to always find and perfectly measure the correct amount of coffee grounds for each type of built-in coffee brew for a cup or carafe of your favorite coffee. I love everything about the Ninja Coffee Bar System. Ninja Coffee Bar System options I love the most. The convenient built-in Ninja Smart Scoop coffee measuring scoop is attached to the side of the Ninja coffee brewer so you can scoop the correct amount of coffee grounds no matter what size cup or carafe of coffee you are brewing. A built-in milk frother that allows you to froth hot or cold milk or even your favorite flavored coffee creamers. Yes, you can froth coffee creamers with the Ninja Coffee Bar frother. Brew a half carafe or full carafe with the glass coffee carafe that comes with the Ninja Coffee Bar System. The removable water reservoir makes it easy to fill the coffee brewer reservoir at the sink. Brew your favorite hot or cold coffee drinks. Turn the power on and it is ready to brew. Or you can wait for it to beep letting you know that the coffee brewer has preheated. Waiting until the brewer has preheated will give you a hotter cup of coffee. Making a frothy cup of specialty coffee at home is easy with the built-in milk frother of the Ninja Coffee Bar System. This is one of my favorite parts of the Ninja Coffee Bar System. 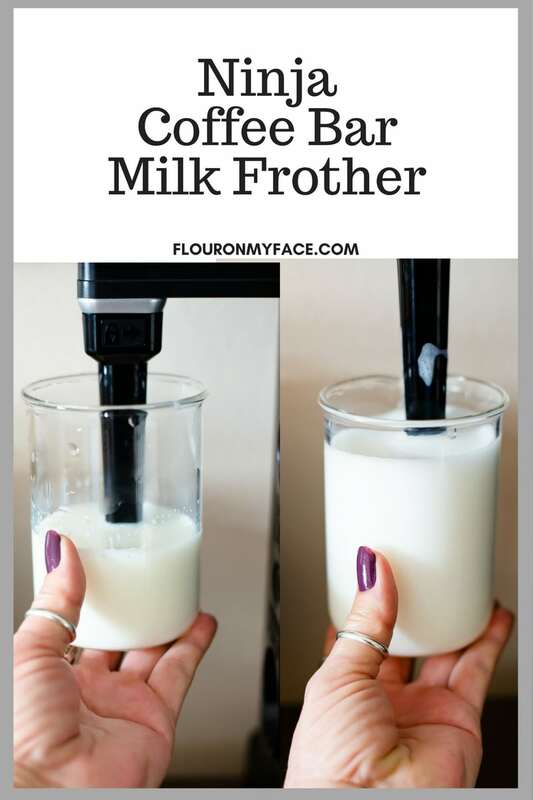 Not only can you froth hot or cold milk at home for coffee house style drinks but you can also froth your favorite flavored coffee creamers. Awesome! I was doing the happy dance while brewing a cup of coffee and frothing my favorite flavored coffee creamer as it brewed. In the picture above you can see how well the Ninja Coffee Bar System built-in milk frother works. In the picture on the left you can see about 4 ounces of warm milk as I start frothing after about 30 seconds you can see how the milk has doubled in volume. You can set up your DIY Coffee Bar with just a coffee maker, your favorite coffee, and some cute coffee mugs on the kitchen counter. Or you can go all out and set up a cute DIY Coffee Bar that is ready to serve and brew coffee house style coffee drinks at home with a great coffee brewing system like the Ninja Coffee Bar System. 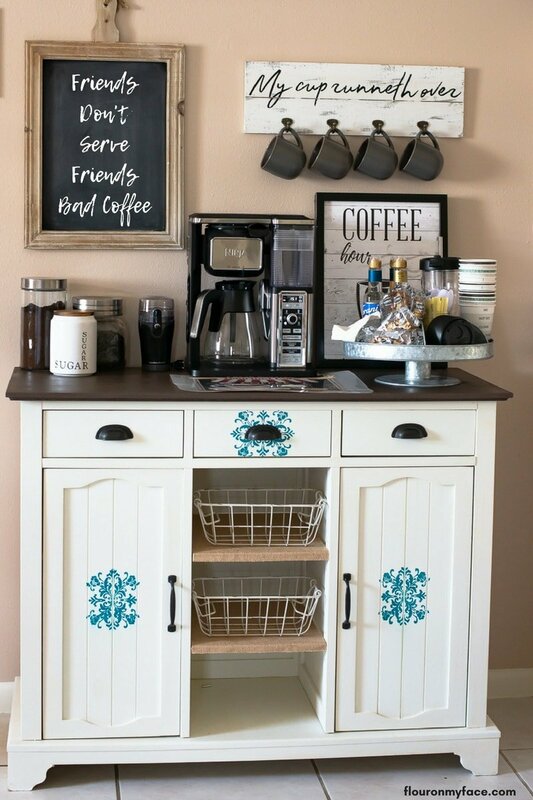 If you have enough room you can turn an old cabinet into a coffee bar station and decorate that area of your kitchen with fun coffee signs and coffee themed decorations, along with all the little extras like flavored coffee syrups, flavored coffee creamers and individually packaged cookies for when you want a little sweet treat with your coffee. I have been wanting to set up my own coffee bar station at home for over a year now. Tucked away in a storage unit I had the perfect cabinet to turn into a kitchen coffee bar station. All I had to do was get it to the house, clean it up a bit and paint it. I finally had the chance to pull it all together. I’ll share my DIY coffee bar station makeover in another post soon. Disclosure: Product links are affiliate links. I will earn a small commission if you make a purchase. Ninja Coffee Bar Brewer System with Glass Carafe and built-in milk frother: If you want to experience the flavor of coffee house coffee the Ninja Coffee Bar is the perfect home coffee brewer that will allow you to brew all your hot and cold coffee house drinks at home. Coffee Mugs: Pick coffee mugs that match your coffee bar cabinet and kitchen colors. Coffee Canister filled with your favorite ground coffee. Coffee Cannister filled with your favorite coffee beans. A Coffee Bean Grinder: A coffee bean grinder is a must-have to grind your favorite coffee beans each time you brew a cup or carafe of coffee. A wooden wall mounted coffee mug holder with hooks to hang your favorite coffee cups on the wall by the coffee bar. 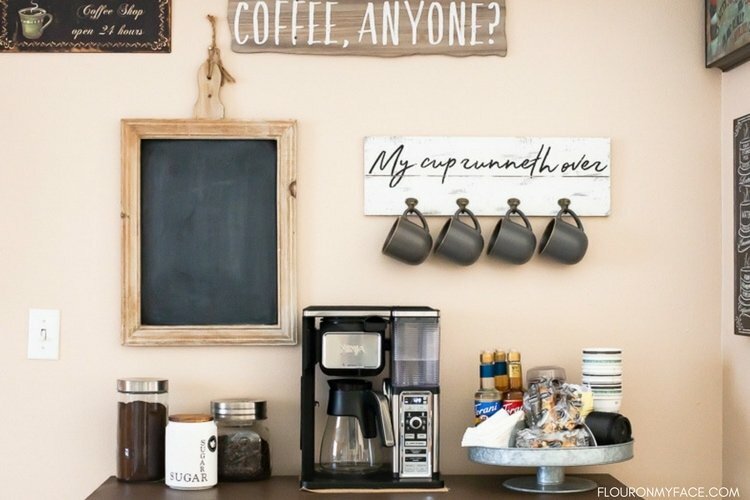 Wooden or metal signs with coffee sayings to decorate the wall. An optional chalkboard to write a cute coffee quote on. For more ideas on how to set up a DIY Coffee Bar check out my Coffee Lovers Gift Guide.